Leo Weiner, as you might expect of a Hungarian composer, has had support over the years from Hungaroton. In more recent years this has taken the form of CDs of his tone poem Toldi as well as of his Violin Concertos on HCD32185, the Csongor es Tünde suite on HCD31740 and a selection of the Divertimentos on HCD32424. His name has been carried further afield by his ballet Csongor es Tünde. Weiner's music for violin and piano has been recorded by Hyperion. These five Divertimentos and Serenades are not going to surprise you by being heaven-scarifying pieces. That is not Weiner's way … at least not here. The Serenade is light but not facile. The idiom is folk-nationalistic romantic but not heavy-textured or cheesy. The shapely third movement of this work for small orchestra opens with a delicious extended solo for clarinet. Its companions are lively. The skirling five movements of the First Divertimento are modelled on Hungarian Dances. The effect is innocent rather than over-gunned, sturdy not overbearing and whirling rather than furious. Fritz Reiner is the dedicatee. Jaromír Weinberger (1896-1967) might perhaps have been inspired by the last movement of this Divertimento for his opera Schwanda the Bagpiper (1927). The four-movement Divertimento No. 2, for strings, is a delicate, gossamer-winged and lively piece given gravity by a lovely short but solemn Andante. The Third Divertimento (called Hungarian Impressions) is for full orchestra. Its mood and manners will appeal if you like Miklós Rózsa's concert works such as the Peasant Song Variations and The Vintner's Daughter. In fact, Weiner has a lighter orchestrational hand. A serene little Tearful movement again provides a good mood anchor. Time after time Weiner's gift for succinct statement and economical development succeeds without seeming short-winded. Most of these pieces are of concert-overture scale with commensurately short movements. Divertimento 4 continues in the same enchanting outdoorsy vein and includes a momentary charmer of a violin solo in the penultimate movement. The Divertimento No. 5 (Hungarian Impressions) for Orchestra is in five movements with the unusually heavily scored first movement running to seven minutes. The three central movements are short and lightly scores with a potent and unusually tragic Tramp's Song (tr. 26) and a Love Song which is more melancholy than tender. The final gurgling and flittering Bagpiper movement brings proceedings to a fluttering and briefly flamboyant close. The recording has plenty of grip and conveys the impression of sound heard from a seat midway back among the stalls. It's certainly not a zoomed-in synthetic effect. Veteran Järvi, as ever, appears to revel in the advocacy of unfamiliar music. His energy is undimmed and time after time he keeps the action floating rather than ponderously weighted. All credit to Chandos for getting 83+ minutes of music onto this disc and for Paul Griffiths' notes although I would have liked information about the premieres of each piece and an appetising trailer for Weiner's other orchestral works. This will hold direct charm if you like Moeran, Kodály, Farkas, Prokofiev (Classical Symphony) or the early orchestral works of Poulenc or Milhaud. 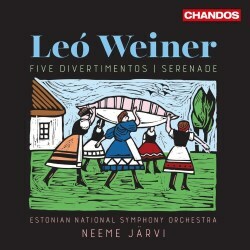 Having delighted us with their Suchon disc where will Järvi and Chandos go next? How about some more late-romantic Baltic or Balkan symphonies. Works meriting some attention include the symphonies of Cuclin, Ivanovs, Skulte (especially his stunning tone poem Waves) and Krsto Odak's Adriatic Symphony.